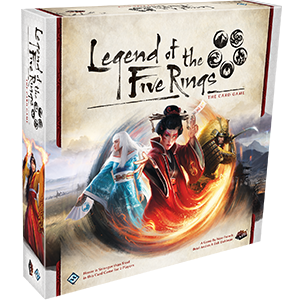 Legend of the Five Rings: The Card Game is a player-influenced LCG® that sees two players take on the role of one of the seven Great Clans of Rokugan, vying for military and political control of the land while maintaining Rokugan society’s strict code of honor. Each player commands their forces with two separate decks: A Dynasty Deck fills their provinces with characters and holdings and a Conflict Deck consisting of tactics, maneuvers, followers and attachments that can be used to turn the tide in a struggle for supremacy. During a game, players will engage in conflicts, both political and military based, with the goal of breaking their opponent’s stronghold and winning the game. But the rules of society are absolute, and even in the fire of battle and heat of Rokugan’s courts, clans must remember the tenets of Bushidō, lest they lose everything in their single-minded pursuit of glory. The Legend of the Five Rings: The Card Game Core Set comes with everything a player needs to explore the seven great clans of Rokugan, the Crab Clan, Crane Clan, Dragon Clan, Lion Clan, Phoenix Clan, Scorpion Clan, and Unicorn Clan. It also includes a variety of tokens, cards, and rule sheets that make the Core Set the definitive starting point for the Legend of the Five Rings: The Card Game. STRATEGIES stocks expansions for this game. Please call or email us for availability.